Eager to bring an end to the “age of testosterone” that some Icelanders blame for their country’s current financial woes, 60-70 percent of the population is expected to vote for interim Prime Minister Johanna Sigurdardóttir, giving her a mandate to lead the country on a more permanent basis. Vowing to clean up the mess caused by male-dominated political and banking systems, Sigurdardóttir has filled half of her cabinet positions with women, and put women in charge of the country’s two ailing national banks. 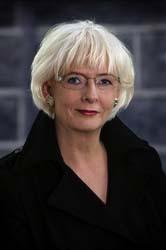 Sigurdardóttir, 66, is Iceland’s first female Prime Minister and the modern world’s first openly gay leader. She took over on an interim basis last February, after widespread protests toppled the government of Prime Minister Geir Haarde in the wake of the country’s spectacular financial collapse. In 2007, Iceland was #1 on the United Nation’s Human Development Index for its high standard of living, literacy and life expectancy. By October 2008, the nation’s three main banks had all collapsed, the country was brought to the brink of bankruptcy, and the International Monetary Fund had to step in with a multi-billion dollar bailout loan. Still, unemployment has risen fivefold, the currency has collapsed, interest rates and inflation have soared, and Icelanders are overwhelmed by debts amounting to 850% of GDP. Iceland’s most famous person, pop singer Björk, is also taking advantage of the crisis to promote women in leadership roles. Teaming up with two female entrepreneurs, she has created an investment fund to help the Icelandic economy recover through green technology projects. The fund’s mission is to bring female values into the mainly male spheres of private equity and wealth management.